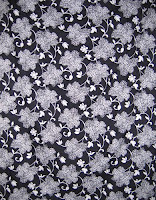 I love the smell of silk, but when sewing, as in life, there is always a temptation to cut corners. To jump past the details of accomplishment and go for the results. I suppose there are times when it makes sense to do this, but when we stop and take the time to contemplate each step along the way, new discoveries and a better garment is made. 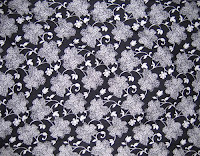 Take this fabulous piece of silk pique fabric screaming to be made into a very in-style shift for Summer 2008. It is silk. It is black and white. I will want it to stay a crisp black and white. I will most likely dry clean it. I could skip the pre-wash and dive right into cutting and sewing, but there may also be the day when I will want to retire it from dry cleaning bills. What did I discover as it was drying from the pre-wash I almost bypassed? When cut on the cross grain the narrower repeat of the pattern fits perfectly between the center front seams. The position of the bold print running from neckline to hem at the center front is key to its use. Cutting along the cross grain also lends itself to a couture trick of using the muslin made to fit the pattern as the pattern itself. The muslin is a rough draft of the garment. It is not meant to be finished. Its primary purpose is to test the design and fit of the garment. 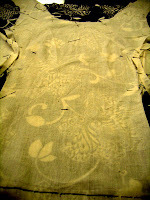 Key fit points are marked on the muslin from the body and replace those of the pattern from which the muslin was cut. In this case, the hip line is a very special demarcation. 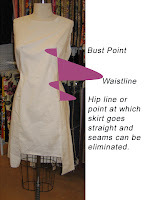 Above the hip, the seams of the garment are curved to the shape of the body. Below the hip, the seams are straight. that means they can be eliminated from the final garment and the print can run continuously around. After fitting, the left side seam is opened, but all other seams are left intact below the hip line. Above the hip line, the seams become darts. The muslin pattern is laid on the fabric. When translated flat it looks something like a map that has been cut from a globe. What had been a 4-piece pattern, with 7-distinct fabric pieces to sew together, is now a 1 piece pattern, with 1-seam and 5 darts. The print will run with interruption only on the left side seam from below the hip-line. The print is matched as well as it can be. As an added bonus, about 1/2 yard less fabric is required to make the garment than had it been cut with the lengthwise grain.